Daily Drama 44 | Happy Halloween! Something funny is happening around here. I think the guinea pigs are getting bigger! This is me, Dobby, in my Halloween costume from a few years ago, I think it was 2011. 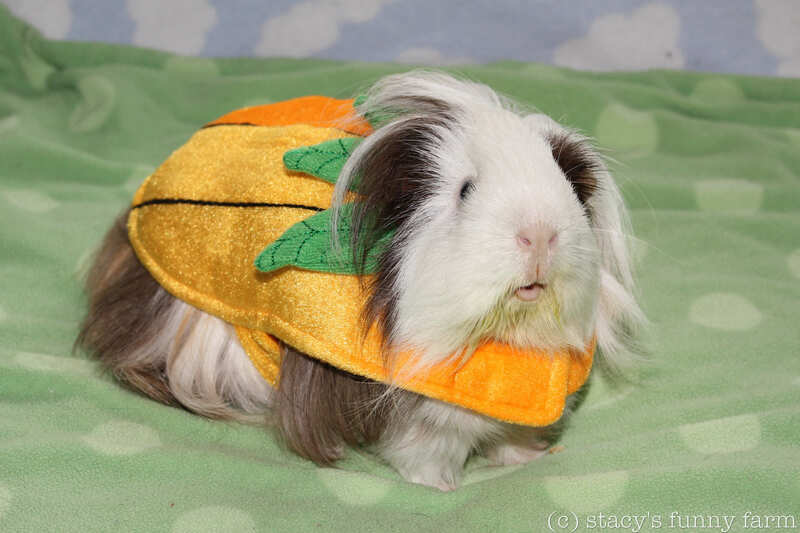 It’s a pumpkin, and it fits me pretty well, I think. You can see from this photograph that I’m very, very big. About the size of a train. 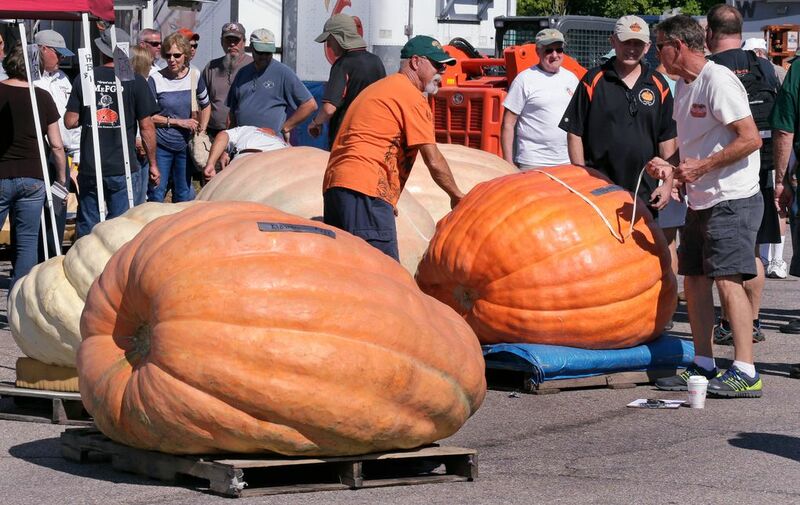 So I’m not just any pumpkin, I’m one of those honkin’ huge squash that they put in the newspaper. 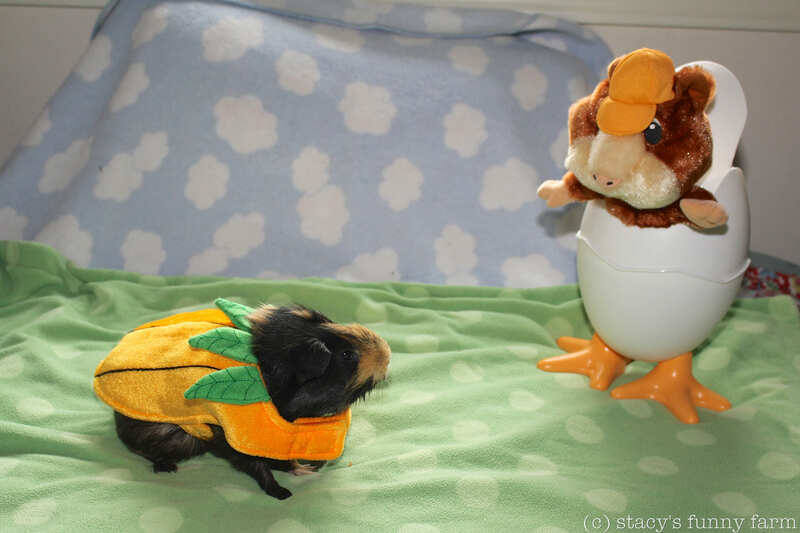 So you tell me, please, what in heck is going on with these guinea pigs? That’s my costume! 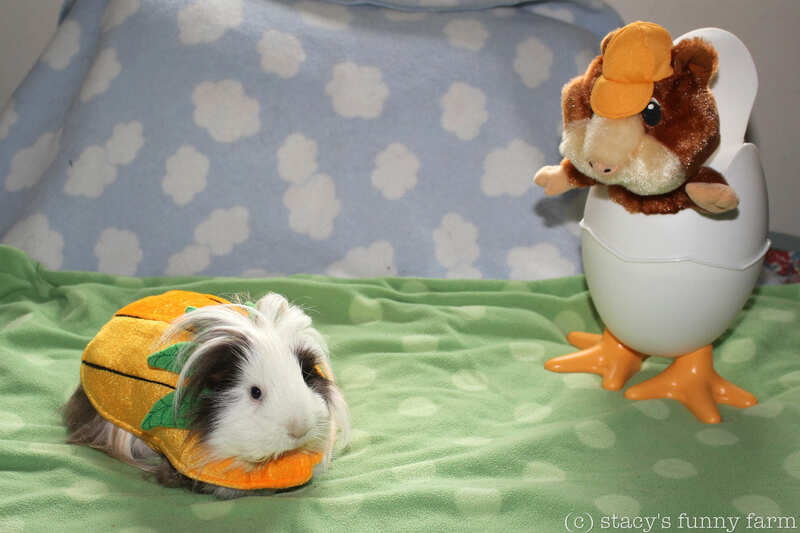 THOSE ARE SOME HONKIN’ BIG GUINEA PIGS! And what the HECK is that thing over there? 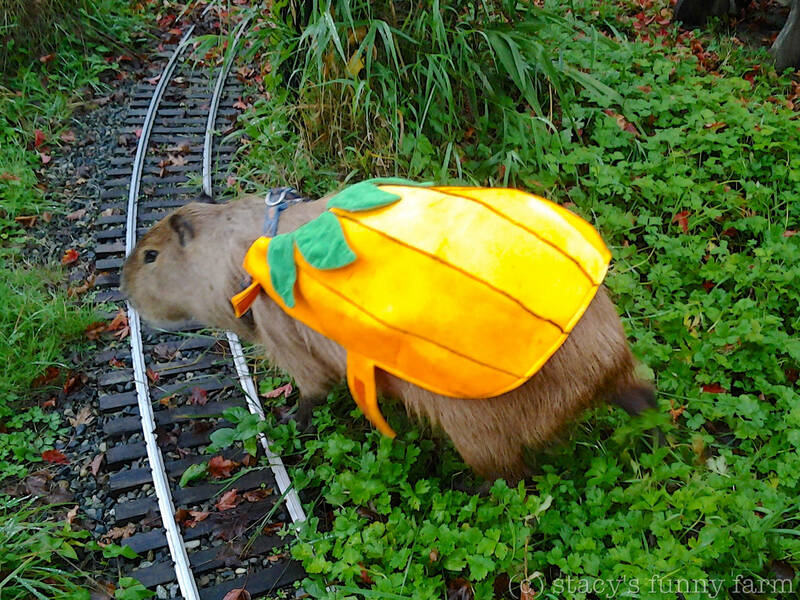 A guinea pig version of The Wrong Trousers or something? It isn’t just Stevie Ray, either. Look at Fred! He’s huge, too! Easily as big as a train, wouldn’t you say? Here’s our Birthday Boy, Carl! He just turned 8 years old! Carl, how does it feel to be an eight year old codger? Have a deliriously delightful halloween! What is Dobby looking at? Why did he park himself at the gate to the aviary? It’s raccoon season. I have a love-hate relationship with raccoons. As long as they stay out of my aviary and leave us alone, I’m okay with them. But they are clever, vicious, disease-ridden, and a constant reminder for me to be ever-vigilant. Right outside the gate, but outside is better than inside! It’s great having volunteers! Look at Kim, pretending to be a guinea pig! Kim is actually up in the cage. The cage needed a tune-up. I’m not willing to leave the walls unprotected to see if the guinea pigs try to eat them like my rabbits and parakeets do. However, the back panels protecting the wall were odd colors, and were slipping down. They’re all white now, and attached to the horizontal red ones for support. Kim is especially partial to Carl Sagan. Kim and Carl, BFF’s Forever! We had a big windstorm and 14 hour power failure. Because Connor trimmed back all those branches last summer, we didn’t have any damage to the aviary. 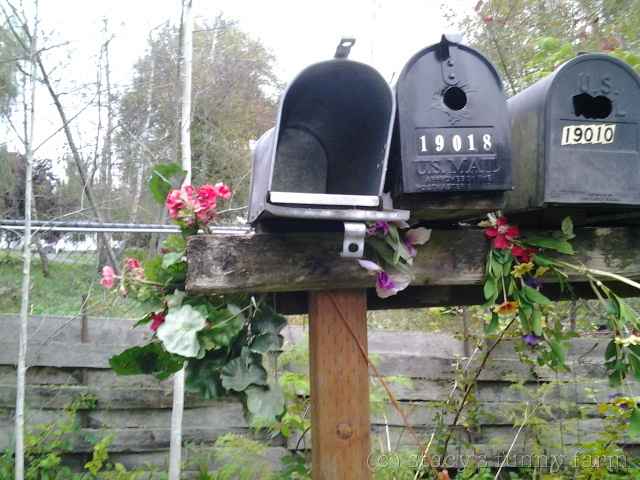 I was surprised to discover that the old mailboxes, now relocated as birdhouses to the front yard, had taken a hit. Three boxes are open, the far left one is askew, and Dobby’s flag is drooping. 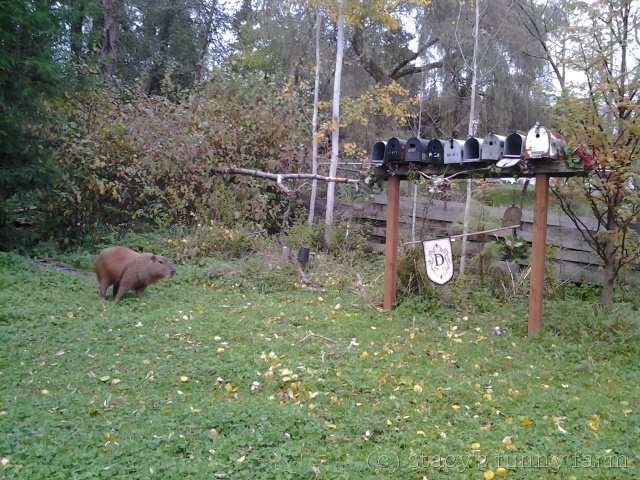 In the photo above, please also notice the horizontal branch to the left of the mailboxes. 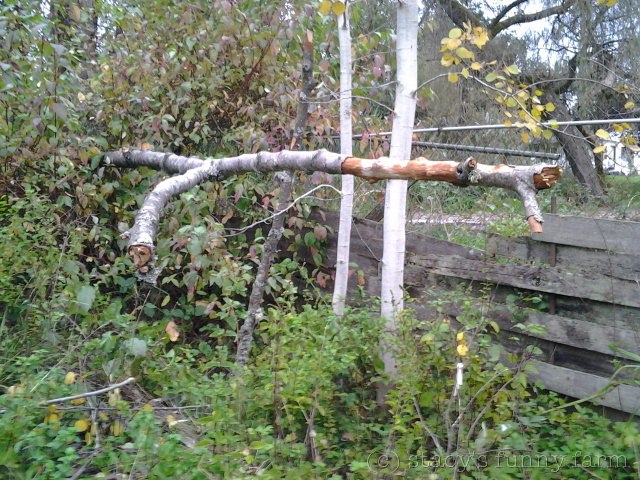 That was not my tree until it fell into my yard Saturday night. Here’s that tree, or rather, what’s left of the treetop after it shattered itself on the old mailboxes. Thank you for the tree, neighbor! Maybe it was trying to escape. 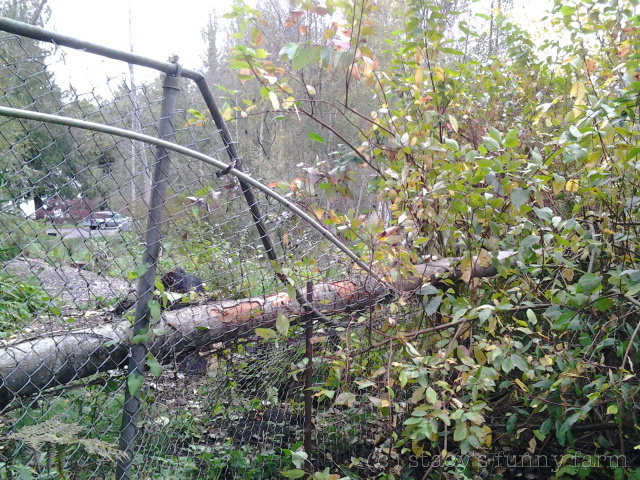 The last tree that tried to escape onto my property was a full-sized weeping willow. When it fell over, the roots turned skyward, breaking the edge of the pond, causing a bit of a flood. This attempted escape was very subtle. 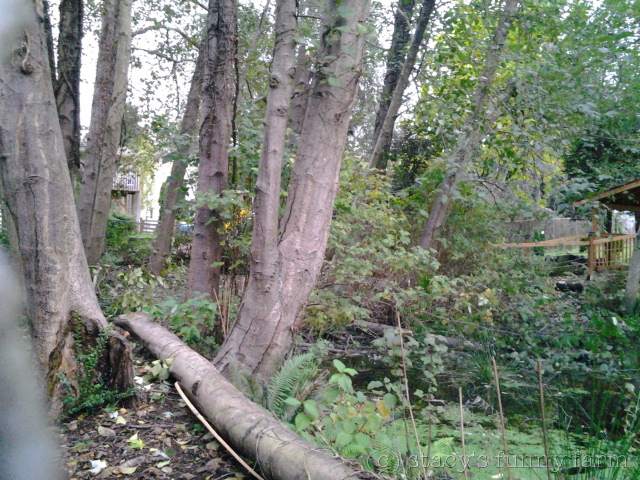 The photo below looks back at their property from mine, toward the newly created stump. That’s Scamp’s turtle pond to the right. A second tree broke off near this one and is still laying in the middle of his pond. My neighbor lost 6 trees altogether. It’s all wetland over there, and the dead fallen trees make excellent habitat for amphibians. My neighbor is very efficient and has already removed the tree off our fence. 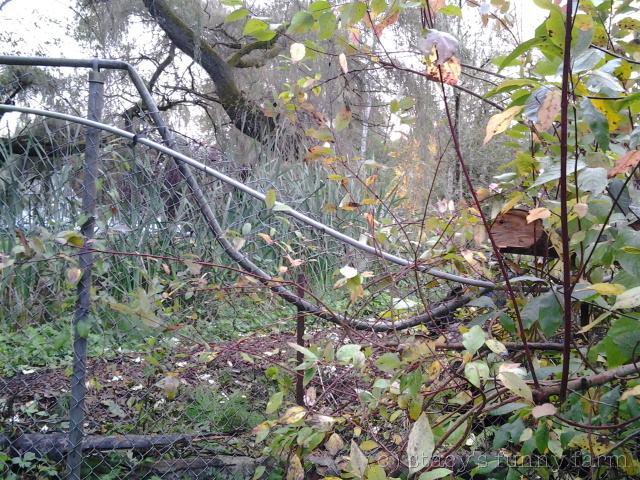 The larger bent pipe is the top rail of the fence. It’s still high enough to keep curious capybaras out of his pond. (Yes, I should take him over there, but I’m not confident I would ever get him to come back. Plus, from the pond next door he would readily find the creek that leads to nearby Lake Washington.) The smaller pipe, not so bent, is electrical conduit leading out to the greenhouse. Maybe I should get that checked out someday. Earlier in the week, tragedy strikes. The graveyard has a new resident. 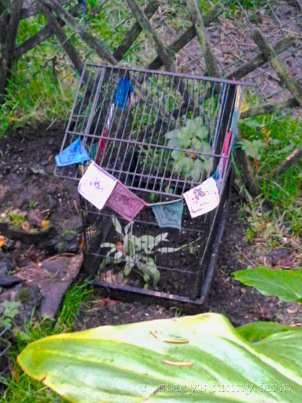 Little Krumpit, my handicapped Sparrow, died abruptly at the age of 5 years. This has been a year of many losses, but I am surprised at how much I miss this tiny bird. My little indoor flock has also been affected by his departure. Dobby has been allowed to carve his own pumpkin. He has gashed a couple jagged scars in it. 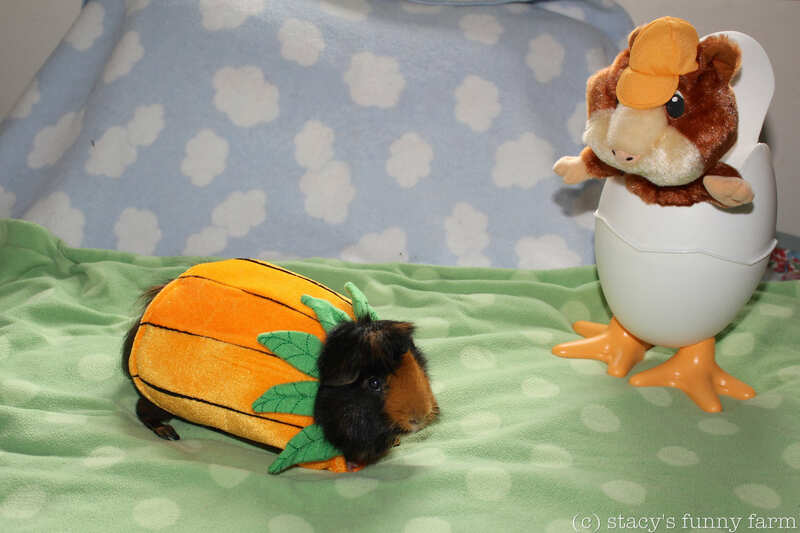 Now that Halloween has passed, we’ll see if he’s interested in sharing it with the guinea pigs, rabbits, and chickens. Or whether the squirrels will haul it up a tree, to join those decoys!